Overview: Cowboy doll Woody feels his status as favourite toy is threatened when his owner receives a high-tech Buzz Lightyear action figure. Pixar Animation Studios; 1995; Rating PG; 81 Minutes. There’s a First Time for Everything: Toy Story was the very first computer-generated feature film. Arriving in theatres just one year after Disney’s acclaimed 2D animation The Lion King, the technological advance was astounding. From Buzz Lightyear’s clear helmet – complete with its reflections and squashed flies – to rain drops streaking down windows, Toy Story’s technology enabled the creation of an animated world so detailed and lifelike it shook the genre. The sheer quality of Toy Story’s visuals, including the beautiful use of light to suggest passage of time throughout scenes, propelled animation into a new age. For this reason alone Toy Story deserves a place in the pantheon of cinematic greatness, but it doesn’t explain why modern audiences continue to view it so fondly. Since 1995 Pixar’s technological advances have been great – take, for instance, Sullivan’s Fur in Monsters Inc and the corroded metals in WALL-E. Today’s visuals far exceed those offered in Toy Story, so what exactly is it that keeps us coming back? Technology Fosters Subtext: John Lasseter’s Pixar team knew the advantages of computer-generated visuals added up to more than simply looking good. Toy Story frees itself from the constraints of traditional animation, taking many of its cues from live action instead. Lasseter shows us the world through Woody’s eyes, giving us rapid tracking shots as he’s frantically carried upstairs, askew angles as he watches from awkward positions and narrow letterbox frames as he peeps out from a toy chest. It puts us right inside the story, but Lasseter doesn’t stop there and uses the vast potential of his animation to convey an intricate web of subtext. Woody (voiced by Tom Hanks) and Buzz (voiced by Tim Allen) reveal their feelings through glances, brief facial expressions and minute changes in the eyes. Tim Allen himself claimed some of the best ‘acting’ appeared in the moments without any voice work at all, when the characters silently reflected. Ambition that stretches to infinity and beyond: It’s clear Pixar saw their first feature as much more than a children’s film. Edgy gags for grown-ups are subtly nested inside the family friendly story, whether it’s Woody shouting “stop it you zealots” at a bunch of claw worshipping aliens or Mr Potato Head accusing Woody of “laser envy.” Frequently Toy Story’s wit extends beyond the verbal sparring to full blown parody. Made by film lovers for fellow movie fans, Toy Story borrows plentifully from other genres. Opening on a child’s take on Westerns, Toy Story goes on to feature an army mission complete with wounded soldier, a Raiders Of The Lost Ark style action calamity, an interrogation sequence and zombies thrusting their limbs from the earth. 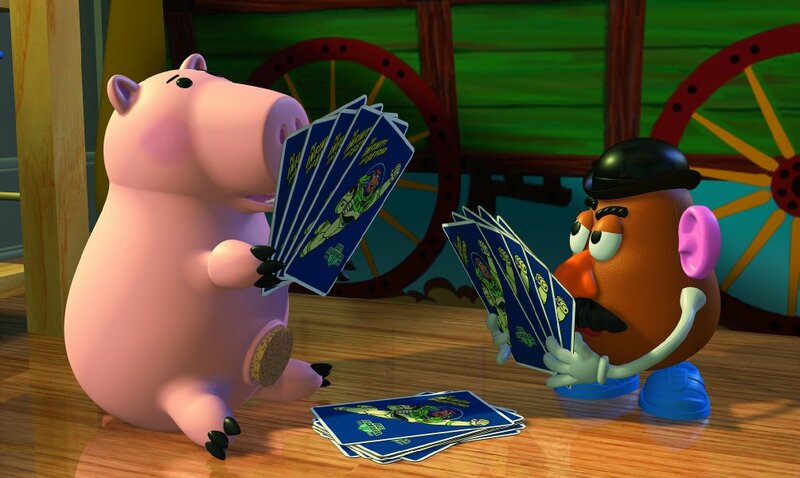 Intelligent and nostalgic in equal parts, Toy Story aims to charm us all. You Are [Not] a Toy: Toy Story’s detailed characterization is worthy of the best live action films, facilitating a much bigger story than the simple surface plot might suggest. Woody and the toys are utterly devoted to their owner, Andy and their sole purpose in life is to make him happy. 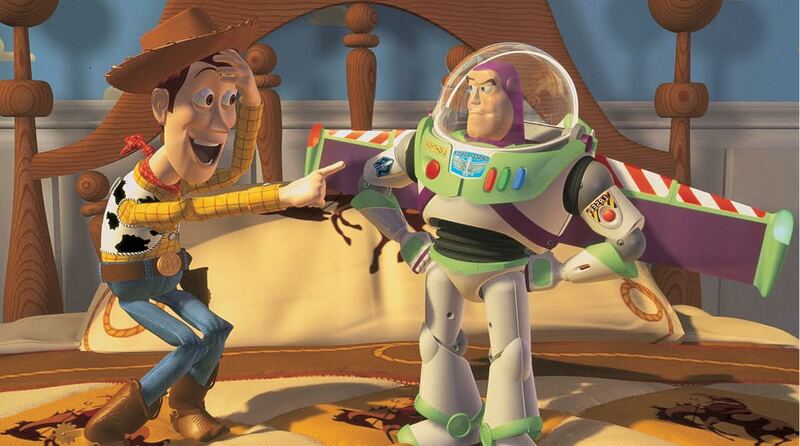 When Buzz becomes a rival for Andy’s affection Woody’s escalating jealousy and desperation is understandable. Why? Perhaps because it reminds us of the challenges of monogamy. Simultaneously it provides children with a succinct message about the art of sharing. Woody and Buzz have to share Andy just as siblings must share parents and children must share toys. Woody’s predicament also has parallels with the adult world of employment. Being a toy is Woody’s job, but he experiences a demotion, colleague scorn, insecurity, feels outmoded, obsolete and eventually becomes “lost”, necessitating reconsideration of what his future role might be. Buzz experiences a similar disappointment. In realizing he is not a real astronaut but merely a child’s toy his dreams are crushed. He’s forced to make the best of what an ‘ordinary’ life can offer. In the process Buzz faces a nervous breakdown and depression. Buzz and Woody’s loss of purpose says a great deal about the difficulties of being an adult in a world that often seems unfair. Of course all of this is delivered in Pixar’s sharp comedic style by pros who know exactly how to balance a scene. It’s hardly surprising Toy Story was the first animation ever to receive an Academy Award nomination for Best Original Screenplay. Woody and Buzz are no longer just toys, they’ve become a part of modern consciousness. Beauty is Fleeting But Imagination Is Forever: Technological advances might eventually leave Toy Story’s visuals behind, but it’s portrayal of childhood is timeless. As long as children have toys they will imagine life. It goes hand in hand with our natural human tendency to see faces in inanimate objects. We’ve seen faces on the surface of Mars and we develop sentimental feelings for material possessions. Pixar has a flair for tapping into these very powerful human instincts. Before Toy Story, Lasseter directed the short film Tin Toy (1988) and before that Luxo Jr (1986), a two minute film about a small lamp. Toy Story takes these ideas to feature length fruition in Toy Story where a rigid adherence to the rules of toys – the way they move and the way they’re powered – evokes warm, nostalgic feelings on the part of the viewer. Toy Story captures the essence of childhood, our fond memories of it and that childish desire, nestled deep in our hearts, for toys to come alive when we leave the room. It’s a very special idea and one that will surely fascinate us for many years to come – it’s in our nature. NextThe AE Tourney of Mythological Movie Heroes, Round One! After starting out life as a local government researcher, Natalie turned her attention to that long nurtured dream of a writing career. Now a film critic for local newspapers in the Midlands, Natalie spends her life obsessing about movies and writing about them. You can find Natalie on her blog Writer Loves Movies and on Twitter @writerlovesfilm.